This varies from day to day. I have a gallery so I need to keep it constantly supplied with bowls, vases and hollow forms, both large and small. I turn a lot of monkey puzzle (Araucaria araucana) also elm (Ulmus procera), burr woods,Â yew (Taxus baccata) - especially root balls - figured maple (Acer saccharum) and eucalyptus (Eucalyptus spp.). I enjoy hoisting a large burr or piece of green wood in the round onto the lathe, removing the bark and deciding what shape to create to make best use of the wood. However, I dislike cleaning up to three or four large bags of shavings from the workshop every night! Very much the same as now but concentrating even more on one-off pieces for galleries and exhibitions rather than practical objects that everyone can make. 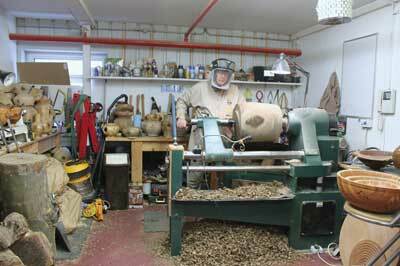 Join a woodturning club and have some lessons rather than teaching yourself. You'll be more confident and know what lathe and tools you need, but more importantly, you'll enjoy your turning much more with sharp tools and benefit from the professional advice. All day I listen to CDs by various artists, including Eagles, Bruce Springsteen, Pink Floyd, James Blunt, Alison Krauss, Don Henley and more! I am reading James Rattue's High Wycombe Past. It is quite amazing that this historic town was once the furniture centre of the country. In 1862, they made a chair a minute, and then, by 1875, 4,700 chairs a day were being manufactured here. I have just started end turning a large 600 x 700mm piece of monkey puzzle. It will make something really special. Large hollow forms. My biggest cutter for pulling the inside out is 2m long and not for the fainthearted! Which turners do you most admire? A good question. Gary Rance for speed and consistency; Simon Hope, for he is an excellent and creative turner; Jimmy Clewes and Stuart Mortimer, again, are both excellent. 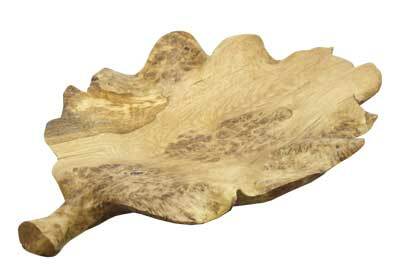 Oh, and Robert W Chatelain - a US turner using wood and resins. However, there are many more I could go on to list. Vacuum pump, bowl savers and hollowing tools all come to mind. But, in my opinion, the best has got to be lathes with inverters for variable-speed control. I hope to see myself still turning, demonstrating and teaching. If you really enjoy what you do and you can make a living from it, then what more could you wish for? People not taking woodturning seriously or understanding that we don't all make egg cups. Art galleries readily accept paintings, ceramics, glass, metal, jewellery and furniture in all shapes and sizes, no matter how bizarre. 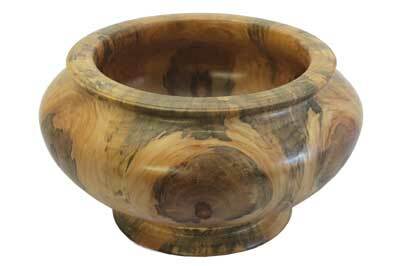 When it comes to woodturning, it's an uphill struggle to convince them. Generally they don't even have a category for wooden art forms, which is a shame, but hopefully we will see this viewpoint shift in the future. None really. It's no good saying - I enjoy turning but wish I had turned professional years ago. I do really enjoy it but I wouldn't have been good enough then to make a living. Obtaining turning skills is all about practice and experience. Once the quality is there, then you need to double your output, know your market and make sure you have enough contacts and outlets to sell what you make. I used to play golf, and before that beach fishing, tides in and out. These took a back seat years ago, but I still follow golf and sport on TV. My life seems to revolve around the workshop and gallery. My wife and I do manage to travel, though, and we have visited many parts of the world. My steinert VB36 lathe, which is an excellent machine. Next, my Hamlet deep hollowing tools, followed by my Proxxon mini grinder with Arbortech cutter for carving, which is very good for sanding bowl bottoms.